The following comes from a Dec. 31 story by George Weigel, Pope John Paul II’s biographer, in the New York Post. No one with a sense of justice can fail to be outraged when, in To Kill a Mockingbird, a jury in Maycomb, Ala., bows to social pressure and convicts an innocent man of a crime he couldn’t have committed. In the re-trial, the defense again demonstrated that it was physically impossible for the alleged abuse of two choirboys (one now deceased) to have occurred, given the layout and security ­arrangements of Melbourne’s Catholic cathedral and the fact that the choir and Pell were in two different places when the abuse was alleged to have occurred. The re-trial jury took days to reach a verdict, during which the jurors asked the trial judge for ­instructions on how evidence should be considered. That an overwhelming vote for acquittal at the first trial was then flipped to a unanimous verdict for conviction invites the inference that the jury chose to ignore evidence that the alleged crimes couldn’t have happened. I too smell a rat. 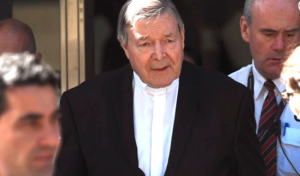 Pell returned to Australia voluntarily and eager to defend himself. That means he’s either innocent or a gambler of Napoleonic arrogance. Pell never struck me as a gambler or arrogant. Does the prosecutor or crown attorney or whatever the name in Australia get to present their side of the story on this site? Given the secrecy of the proceedings, I seriously doubt that the Crown prosecutor wishes to present his side of the story. Too much trust has been broken, by Catholic leaders. And now– is our trust in the country of Australia to be broken, too? Is this country untrustworthy, and worthless– is its society, government, laws, and legal system– worthless?? Should Americans avoid Australia, avoid all dealings with that country– and should we be suspicious of the truth of any news and situations reported, from Australia?? If Cardinal Pell is innocent, let’s hear his side of the story. I’m sure there are many, many Catholic websites that are eager to publish his self-defense, instead of this piece by Wiegel that presumes, with no evidence, that Pell had been “railroaded”. Sorry, Weigel, your fictional To Kill a Mockingbird was not Alabama 1930s, but Hollywood 1960s. For reality outrage try O.J. Los Angeles 1990s.